There is an axiom in my field that you can spend time or you can spend money but you can’t not spend both. I’ve talked a little bit about this before. In truth, much of life comes down to the time vs. money quandary. Those of us not lucky enough to be born with trust funds are forced to trade our time and skills for money on a daily basis. The concept that we’re trading our time for their money is particularly easy to lose sight of if you’ve got an especially keen mind and an overactive work ethic. Your employer generally gets more work than is being paid for because you are driven to finish that project or to do better. This work ethic/desire/compulsion causes acute conflicts in situations where those making the decisions are making decisions that seem non-sensical and anti-thetical to things like an organization’s long-term health, simple, transparent business practices, basic human dignity in the work place. You end up having to remind yourself that they buy your time and if they want to use it stupidly, there’s not much you can do about it if the requests don’t violate your personal boundaries or morals. Since, for most of us, our relationship with our employer boils down to an exchange of time for money, being given an opportunity to actively choose time or money is a strange, disorienting situation in which to find yourself. I was given just such an opportunity recently. I am willing to have my pay reduced now with the understanding that I would be repaid by December 2009 provided funds are reasonably available at that time. I would agree to a deferral of: ” $______________ for the time period of ____________to ___________. I would like it to be a fixed amount per pay period, or ” ____day(s) of my salary per pay period. I will not take any raise for which I may be eligible from June 2009 – May 2010. If you look at this long enough, it appears as what it really is: an opportunity to trade money for time. Not to whine about my job, but I am grossly overworked. Even without major projects I could easily work 50 hours a week every week without breaking a sweat. I serve upwards of 100 internal clients with no idea who is going to be requesting what on a daily basis, and, near as I can tell, I’m the only person in the organization who has to justify how I do my job to anyone who might have a criticism on a regular basis. I will also admit that I am, likely, the only one in the organization who has gotten the mythical merit increase in the past two years. I sat down and I did the math. Giving up 12 days (that works out to a three day weekend every weekend between June 19th and September 4) works out to roughly slightly less than the raise I received last October. I figure I can live on last year’s salary for three months. So for me, giving up the money was worth getting the time. 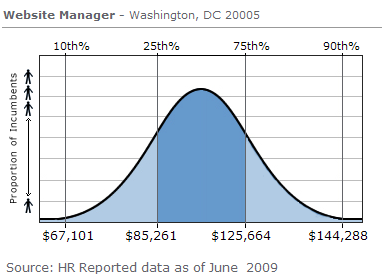 My salary doesn't even appear on this bell graph. That's sort of depressing. I also sat down and did some research and determined that if I’m going to get paid better in my next job, it might help if my title actually reflected my responsibilities: I traded this year’s baseline raise for a bump in title. It may seem silly now, but in a year or 18 months when I’m negotiating salary for a new job my new title will be worth $5,000 to $8,000 a year more in starting pay. What’s most amusing about all of this is that in our discussion about my “voluntary measures” offer TemporaryBoss’ first question was “How will this affect work flow?” Clearly, they don’t recognize that they can have the time or the money, but not both.